Wimbledon – not the tennis and not the Common, either. Most people associate Wimbledon with tennis and some with wombles on the Common. Not many will think of the small, okay tiny, settlement in Southern Hawkes Bay. A bright spark, probably in an office somewhere in Wellington, has changed the boundaries and technically Wimbledon is now in the Tararua District. It’s about an hour-fifty from Napier by car, twenty kilometres south of Porangahau, along Route 52. Once it had a school – they lost that about ten years ago. These days there’s a house or two, the Tavern and a war memorial. As with any journey getting there is half the fun. This is a road trip that lends itself to the classic Sunday Drive, the sort our parents used to inflict on us. These days we enjoy it. There wasn’t much traffic. Those road users who did encounter us gawking at the country-side and chatting as we meandered along no doubt shook their heads in frustration and muttered the insult of all insults: Sunday Drivers! The turn-off to Wimbledon Road is on the outskirts of Porangahau – we could see The Duke – and there was a moment’s hesitation. After all it’s still Top of The Pops with us. But, on the basis that it’s possible to have too much of a good thing, we continued on our way. We’ve promised ourselves another visit there sometime soon. About six or so kilometres along Wimbledon Road we pulled over at the Longest Place Name in the World. Forget the challenges of flash fiction or releasing a short story tweet by tweet, as Jennifer Egan, the Pulitzer winning author of The Goon Squad, did back in 2012. 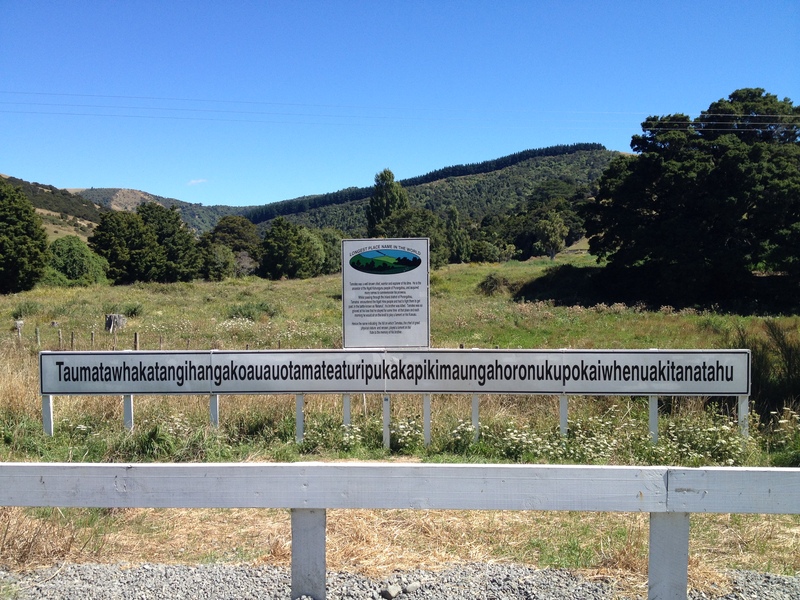 Taumatawhakatangihangakoauaotamateaturipukakapikimaungahoronukupokaiwhenuakitanatahu is a one word novel! The English language sign explains, a lot less eloquently, that Tamatea, the man of great stature (he founded Ngati Kahungunu Iwi) fought a battle with the Ngati Hine. His brother was killed. The grief stricken Tamatea sat on the hill each morning and played a lament on his flute for his beloved brother. In case you’re wondering the four of us did recite the place name together. Fortunately one of us is learning Te Reo and thanks to his help our pronunciation wasn’t too shabby! The language lessons and the long drive raised an appetite and we were quick to place our orders from the menu at Wimbledon Tavern. At more than 125 years old this pub’s a classic. They have some attractive cottages for rent – ideal for a writer’s retreat or a quiet weekend get-away. It’s easy to imagine carriages and gigs pulled up outside, horses hitched to the railings. I wondered if the hotel is haunted. I should’ve asked. The hosts were very friendly and obliging. They remembered one of us from another visit months ago. The servings were generous, look at the size of those steaks, and the prices reasonable. After those meals no-one dared take on a dessert. Our visit to Mangatera might be a few months ago now but the memory of the drive home, our stomachs complaining at the abuse inflicted by way too much food, hasn’t faded! Although I fancied an ice-cream. Good idea: Some of us are considering an overnight visit. The interior of the hotel is decorated with memorabilia. If the weather had been less appealing we might have had another beer and studied it more thoroughly. Instead we went in search of a beach and an ice-cream.